St. Ignatius Loyola Church, the Kim Kardashian of the Upper East Side that’s about to swallow the far more worship-worthy Church of St. Thomas More, is back in the news today. According to a statement from Andrew Cuomo’s office, a private funeral mass for Mario Cuomo will be held at 11 a.m. Tuesday at St. Ignatius Loyola Church on the Upper East Side. Visitors may call at the Frank Campbell Funeral Home at 1076 Madison Ave. in Manhattan from 1 to 5 p.m. and from 7 to 10 p.m. Monday. First of all, the Frank Campbell Funeral Home has long been God’s halfway house for luminaries of all stripes. For the famous and infamous of New York City, 1076 Madison Ave., at 81st Street, is a mandatory stop. For all of them, sadly, it’s the next to last stop. 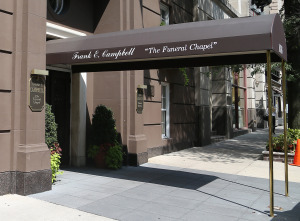 It’s the headquarters of Frank E. Campbell, the ­“funeral director to the stars” whose most recent RIP VIP was comedy legend Joan Rivers, who died this month at 81 . . .
Toss in St. Ignatius and you have the deluxe Upper East Side sendoff. S0 – ave atque vale, Mario. Rest in peace with Leona Helmsley. This entry was posted in Uncategorized and tagged Bishop Furlong, Capital New York, Cardinal Sean O'Malley, Carnegie Hill, Cathaholic, Christopher E. Baldwin, Ed Koch, Ed Sullivan, Fordham Prep, Frank Campbell Funeral Home, gangster Frank Costello, George Gershwin, Greta Garbo, Heath Ledger, Jackie's Agnes, Jacqueline Kennedy Onassis, James Cagney, Joan Crawford, Joan Rivers, Judy Garland, Kim Kardashian of the Upper East Side, L’Wren Scott, Leona Helmsley, Malcolm Forbes, Mario Cuomo, New York Times, Peggy Noodnik, Peggy Noonan, Philip Seymour Hoffman, Rev. Kevin Madigan, Rita Hayworth, Robert F. Kennedy, Roman Catholic Archdiocese of New York, Roscoe “Fatty” Arbuckle, Saks Fifth Avenue, St. Catherine Siena, St. Francis Xavier Cabrini, St. Ignatius Loyola, St. John Nepomucene, St. John the Martyr, St. Thomas More, St. Vincent Ferrer, Wall Street Journal, William Randolph Hearst. Bookmark the permalink. Again, you have me confused with your allusion. What does “the Kim Kardashian of the Upper East Side” mean? I could guess at a bunch of things it might mean, but that’s al they would be–guesses. Sorry, I feel like I am missing a point here; maybe I need a sharpener? It’s just a joke, Bill – you know, flashy vs. modest (the way St. Thomas More is). That wasn’t one of my guesses, actually, so it’s good you are explaining it. Perhaps next time, keep the needs of those of us who are deficient in the subtleties of such modern “culture” icons in mind, please.